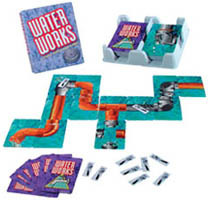 Complete your own pipeline from valve to spout by connecting ten pipe cards in between. But watch out for leaks! You'll have to repair pipes, make detours and spring leaks on your opponents' pipelines to win! Contains: 112 cards, 8 punch-out wrenches and card tray. I just had to add this game. I played this as a kid and always loved it.